**Remember to use my secret code to take 25% off the shopping cart items at Bentley’s Bargains located at the bottom of this post! Get FREE shipping on all orders of $49 or more. We are participating in Wordless Wednesday hosted by our great friends at BlogPaws! Enjoy all of these great wordless bloggers today. Just pretend that you are working on something important. Your boss will never know! Thanks Sugar! Enjoy your day! We think so. ☺ Have fun today Whitley! Bentley you so make a super, super hero. Have a wonderful Wednesday. Aw, shucks Molly♥ Thank you! I have no idea how he does it. He just loves to sit that way, but not on command! LOL! You are my Super Bassett for sure, Bentley! Amazing how you can sit like that! Super-Funny! Way to go Bentley. Now THAT made me laugh! What a cute shot! We are so happy to share a laugh with our friends! You sure do look like a super hero to us! Yay!! If you ever need a hero to help you out of a jam, just bark! BOL....Now that you mention it...hmmm. It's a bird, it's a plane, it's Super Bentley! Keep your eyes to the sky just in case! BOL Bentley! You are definitely Superman...or Superdog...or BOTH! Happy WW! Thanks Oz! I am able to leap...umm, I can climb on the couch! I can't give anything away, but you DON"T want to miss Friday's post! You are Super Bently ... and I bet you can fly with your fabulous long ears. Have a super wednesday! Well, all I can say is be sure to visit on Friday!! He's not Clark Kent? He's a Basset? It has been a well-kept secret until today. Clark Kent is a stand-in! Faster than a speeding bacon treat! Heehee - you've got Superdog and I've got Underdog today! We are so happy that y'all drop by to see us! Do you need any rescuing?? Have fun today! BOL - so true, so true! That is my point exactly! Have a Happy Husky day! OH MY DOGS BENTLEY THIS IS THE BEST POSE AND A VERY TRUE STATEMENT!!! So cute! He's got the big pecs to prove it too! He's been working hard on his physique, thank you for noticing! LOL! That does not look comfortable! Super powers indeed. Definitely Superman! No dog can sit like that. :O Bentley! You won't be able to keep you secret for long if you keep showing us your moves!! Thanks! With Hooch around, I know that you recognize cute!! 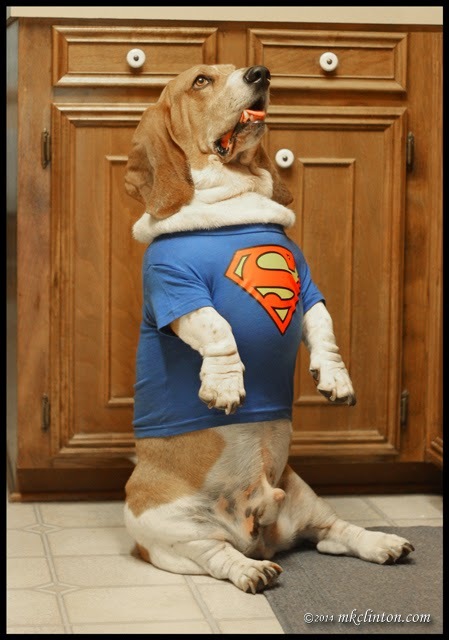 Oh Bentley, Our Person has always wanted a Basset and you certainy look great as superman. Bet you are such a good one. Thanks so much for coming by our blog. We are so glad to meet you. We have lots of cats here but we do have a dog and our Mom has had dogs all her life. Hope ;you have a great evening. The secret is out now, and we expect to learn more about your superpowers. Is posing for treats a superpower? I'm happy to see you here! Bentley loves treats! He won't sit like this if I ask him to, it's just how he sits on his own. LOL! We think you MUST be Superdog for sure! We are ready for our first Blogville event! I can't wait until Fryday!! How does he sit like that?! So cute! It is just how he sits. He been doing it since he was a pup. It used to make me a nervous wreck, because he looks like he should fall over. You are definitely a super dog, Bentley! You are quite the poser too :) I love this photo. hehehe you are do darn handsome. So true. You must be super! You are super cute and super talented, Bentley!! It's a quite a feat getting such a long body vertical! The boys want that shirt!!! Love it - such a SUPER dog!